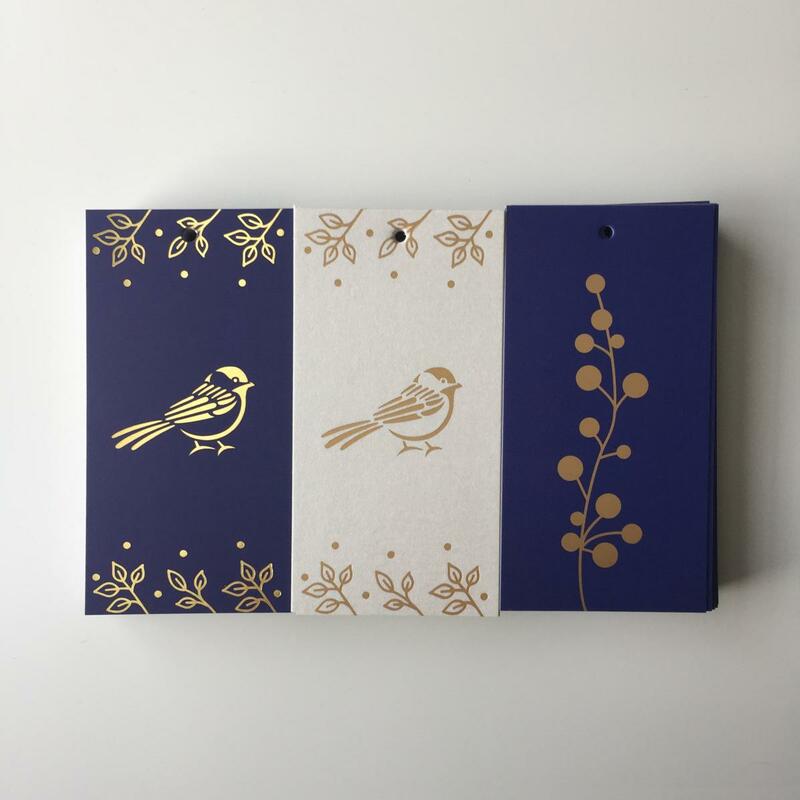 I love birds and started collecting them as ornaments not realizing the meaning behind them. 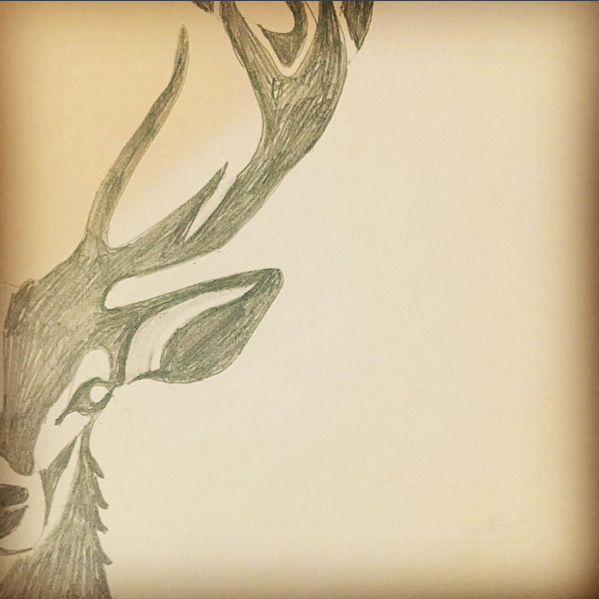 It is said that they symbolize joy and happiness. It is also, apparently, an old Scandinavian tradition to feed the birds on Christmas Day. 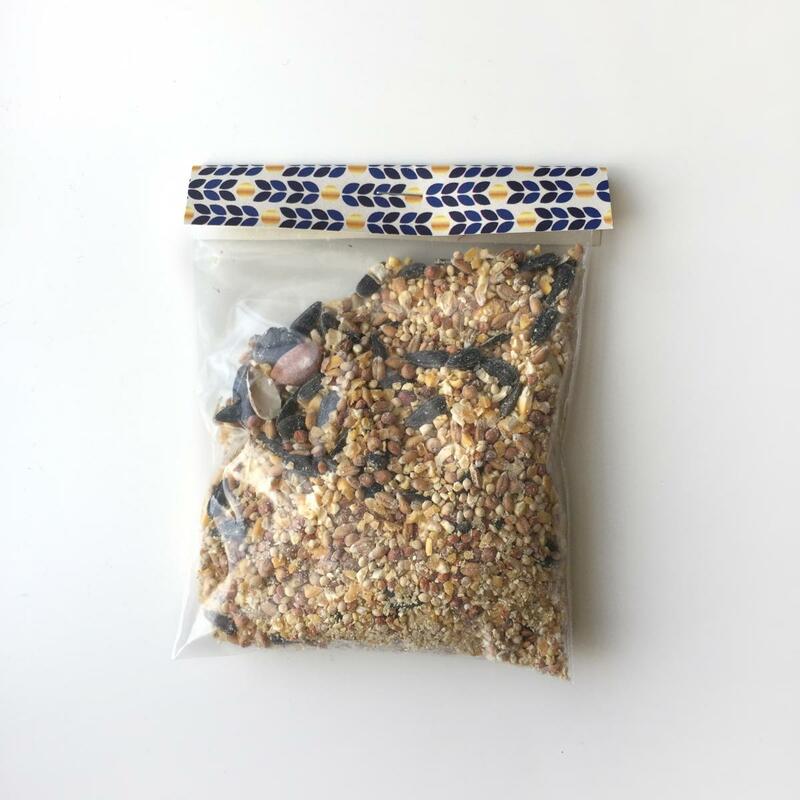 Whether your favourite bird is a chickadee, cardinal or a goldfinch, try a new tradition and sprinkle birdseed on your doorstep on Christmas morning. 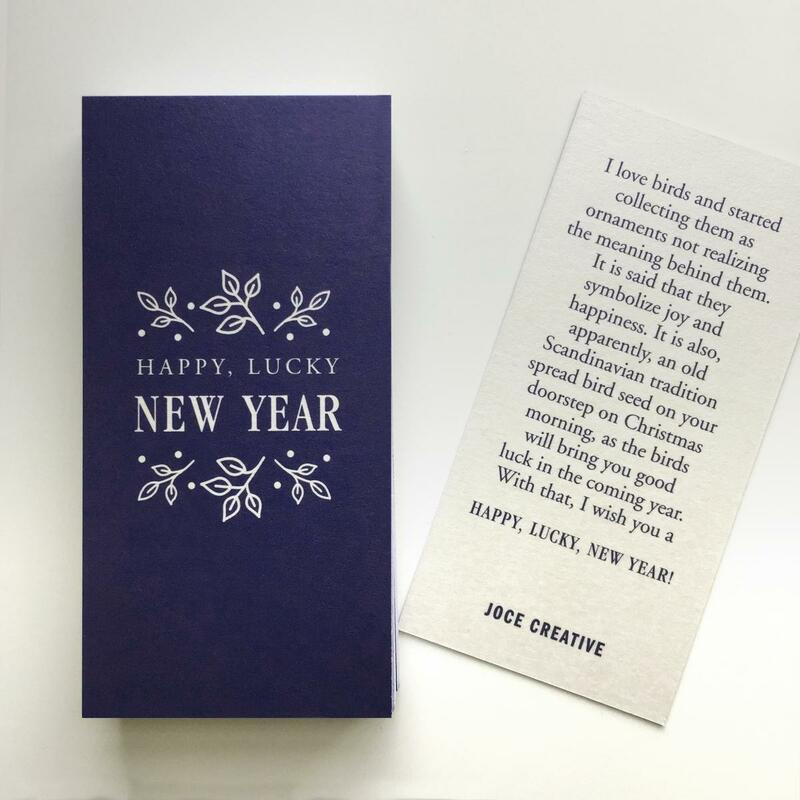 I hope you get a visitor or two and that you have a HAPPY, LUCKY, NEW YEAR! 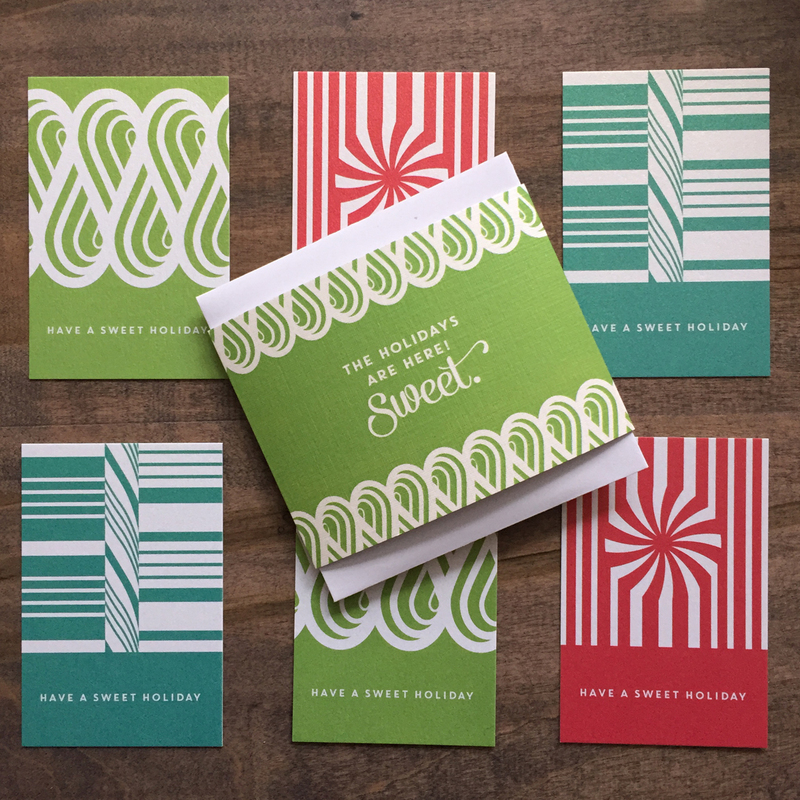 Inspired by visits to my grand-mère, who greeted us with such joy and always offered lots of sweets around the holidays, I give you my take on traditional candy patterns. This exploration of the simple but mighty line, which, when paired with others, curved and twisted, creates fun and bold designs. 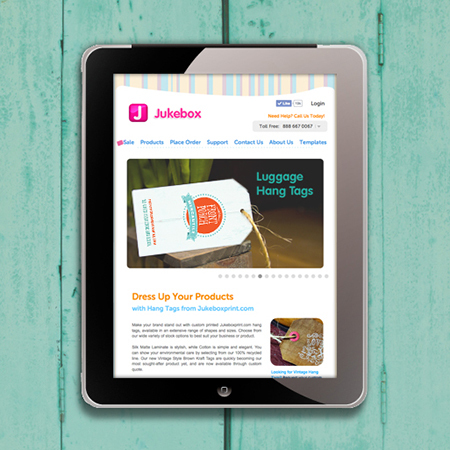 I am excited to share with you my recent feature in one of my favourite design resources, LogoLounge. 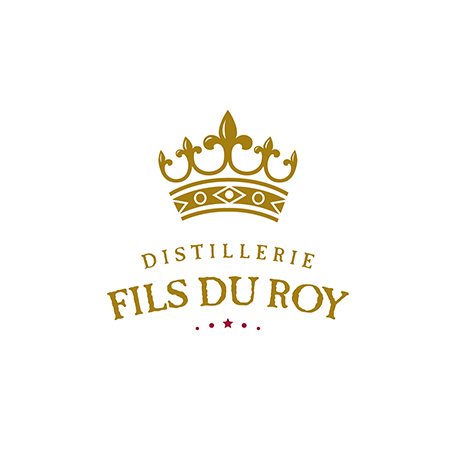 From a pool of more than 23,000 logos, only 2,000 logos were selected by a panel of jurors to be featured in the 9th edition edition of LogoLounge - Distillerie Fils du Roy was one of them! 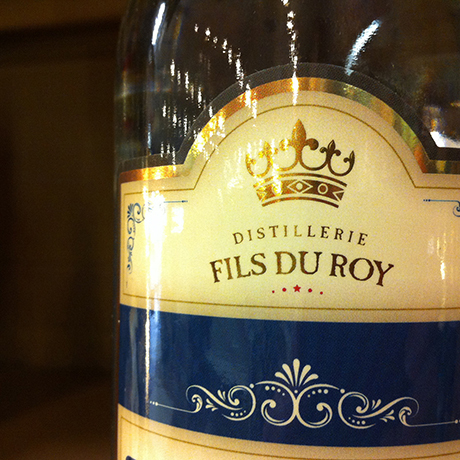 Distillerie Fils du Roy is a logo I designed for the design firm, Mistral Communication. The logo is featured on award winning cranberry liqueur, gin, anise and vanilla liquor as well as other products, all manufactured in New Brunswick, Canada. 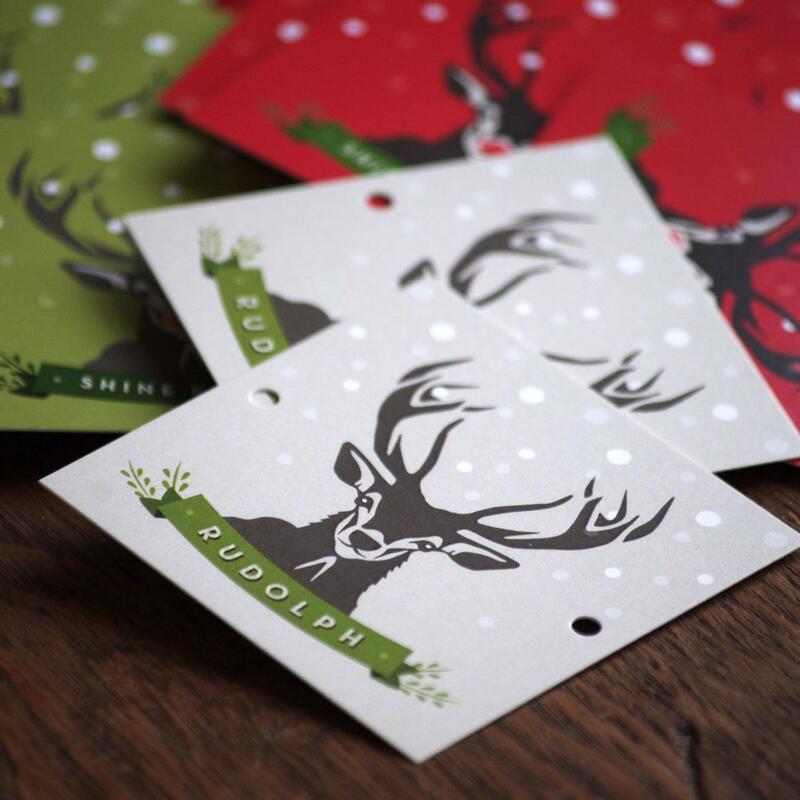 Labelling was designed by Mistral Communication. 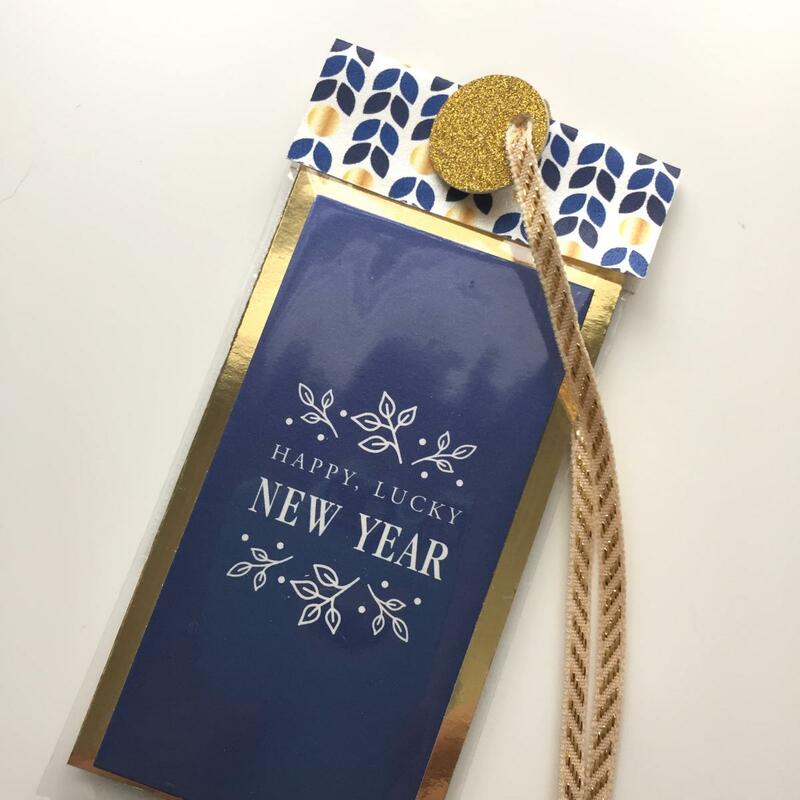 When I was researching various paper folding techniques for my client holiday card, I came across a thaumatrope, a 19th century toy. 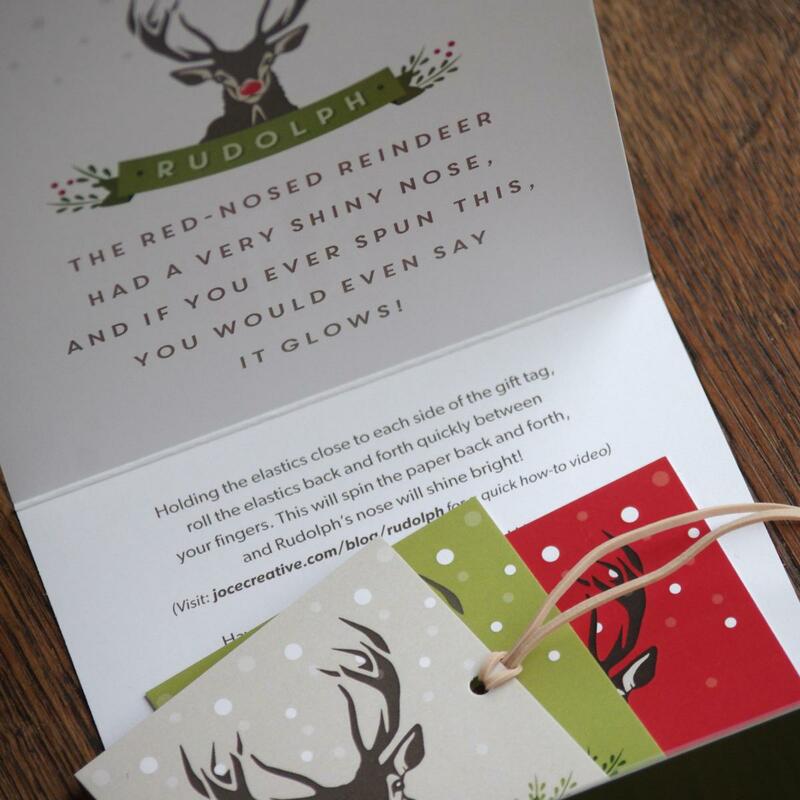 You may be familiar with the Bird in a Cage and various other spin toys; the shape lended itself perfectly to another gift tag for my clients. 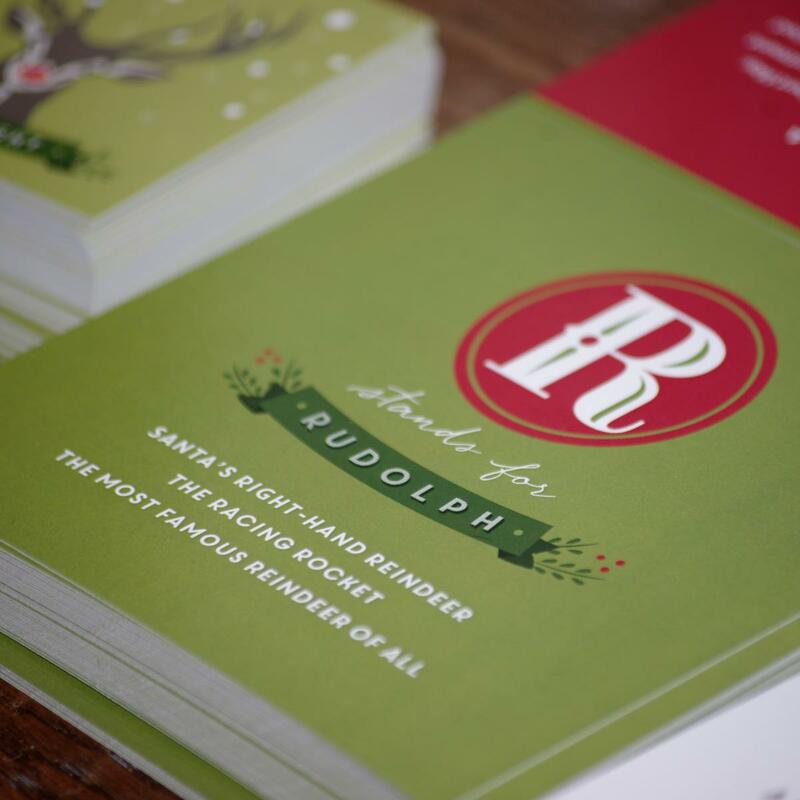 I have a love for Rudolph, (and who doesn't like Gene Autry's version of Rudolph The Red-Nosed Reindeer?) so I chose him as my subject, and created an original drawing of him. 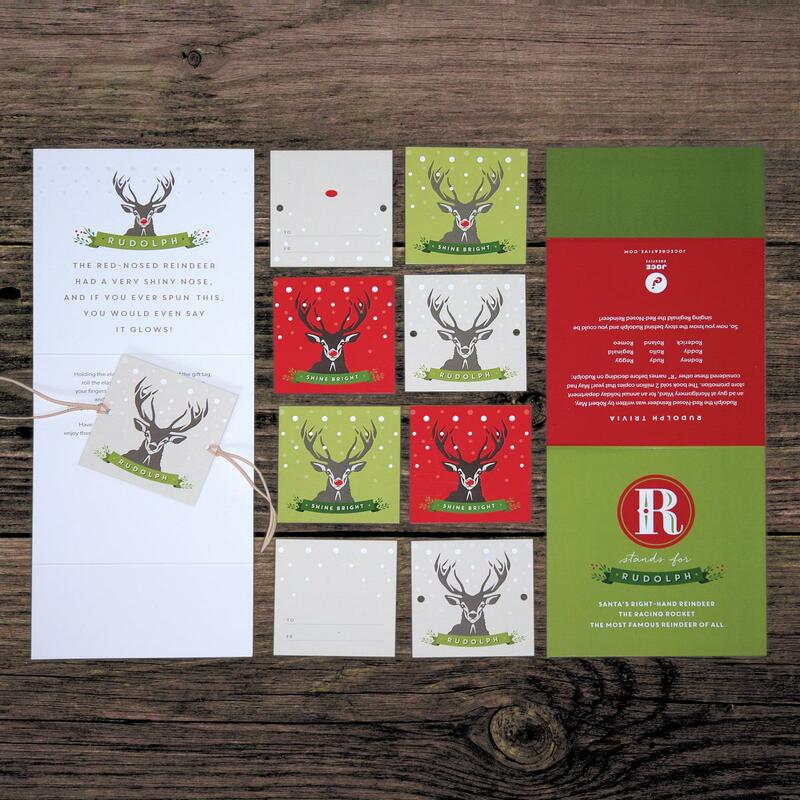 Rudolph the Red-Nosed Reindeer was originally written in 1939 by Robert L. May, an ad guy who worked for Montgomery Ward, a department store. 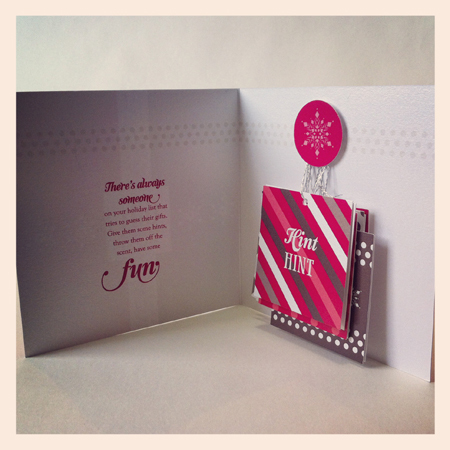 The store manager wanted to publish a Christmas story as a holiday promotion. May decided to write a story about an underdog reindeer, named Rudolph, who got chosen by Santa to guide his sleigh. May himself was somewhat of an outcast, and so it was important that his story got published even though his boss was unsure about it. 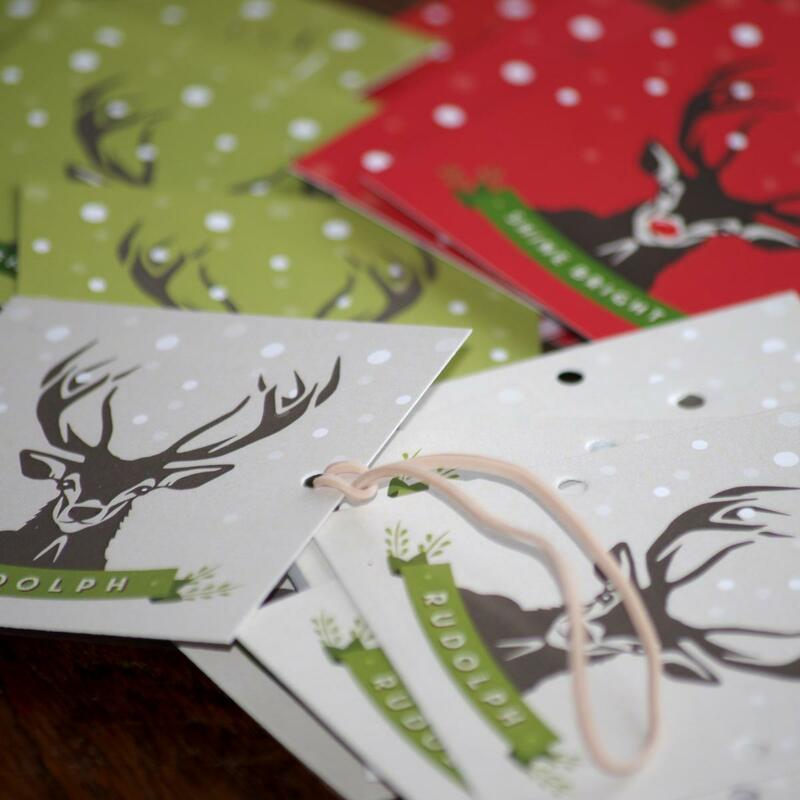 May insisted the story would sell, presented his sketches and that year, Rudolph the Red-Nosed Reindeer sold more than 25 million copies. May had thought about using other "R" names such as: Rodney, Roddy, Roderick, Rudy, Rollo, Rolland, Reginald and Romeo. 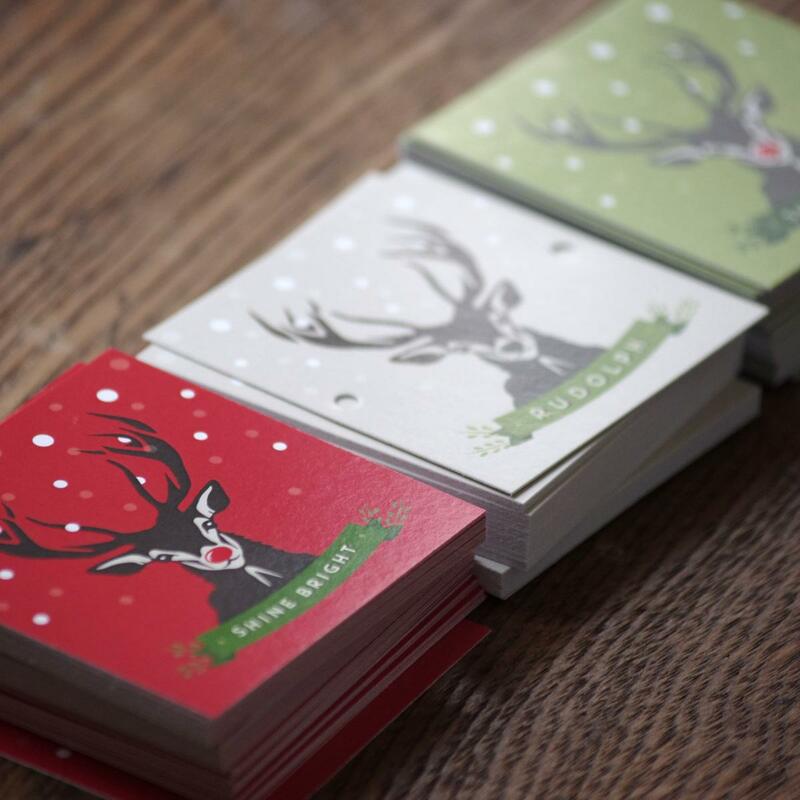 How funny would it be to sing Rollo the Red-Nosed Reindeer? 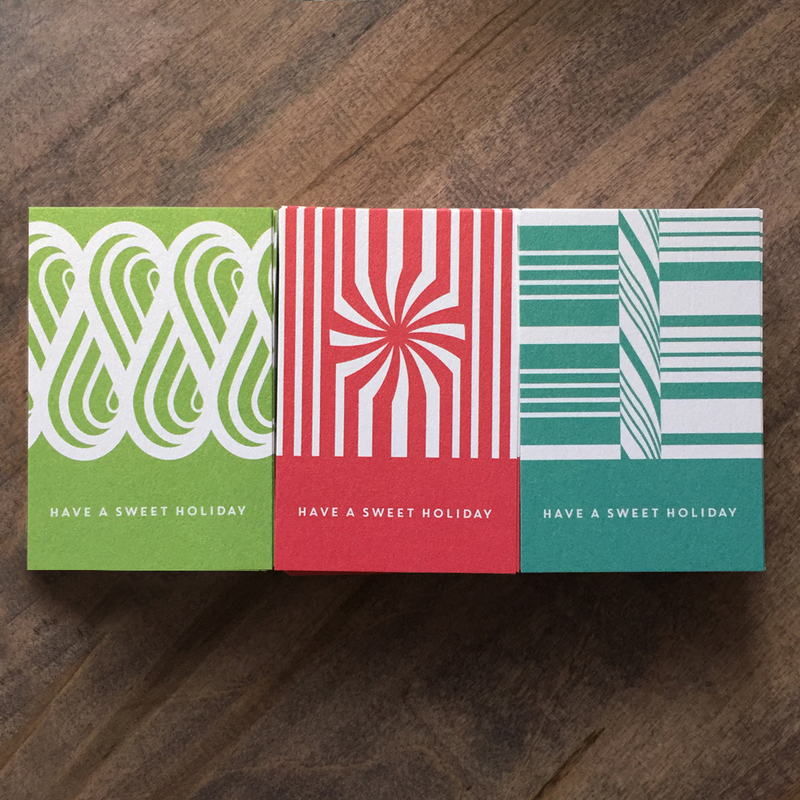 Have a merry (and bright) holiday! As designers it's always nice to get compliments on your work, but super cool when the company who printed your work asks if they can feature it on their website! 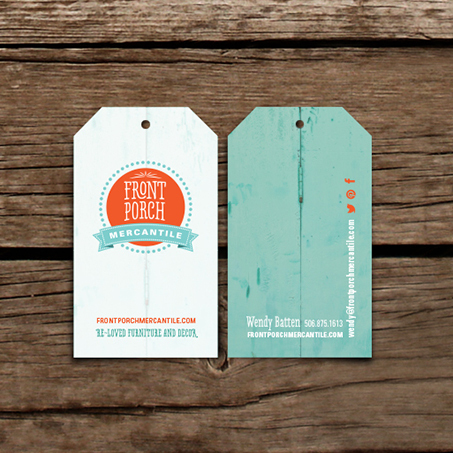 If you look through JukeBoxPrint.com's website, particularly in the Hang Tag/Specialty section, you'll see a card I designed for Front Porch Mercantile. 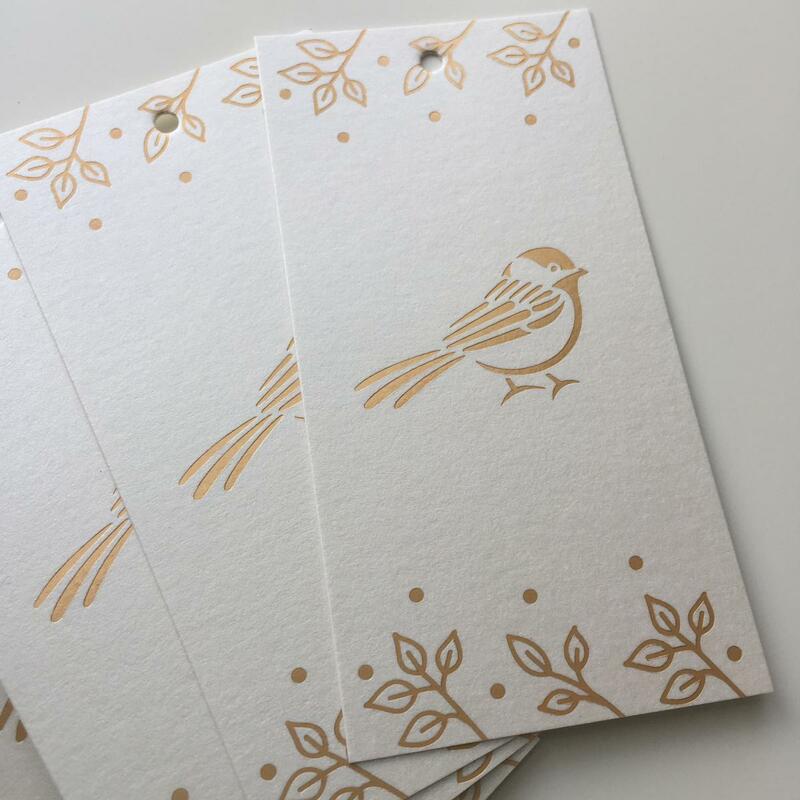 We chose JukeBox Print because they were able to print the hang-tag style cards with a silk matte laminate finish on a nice, heavy 16pt stock. 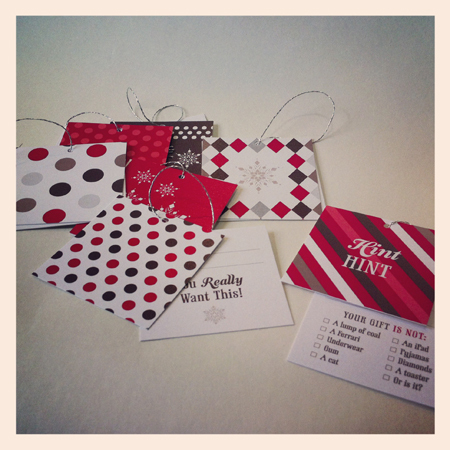 The cards double as products tags and make a really fun card for Front Porch Mercantile to hand out. And if you happen to be travelling through Lower Coverdale New Brunswick, make sure to stop by and visit the shop! Owner Wendy Batten's furniture and fabulous Canadian-made paint will make you want to re-love your furniture! Picture this: you have just started your university course, and your prof has just announced that you will be grading your own projects. At first I thought it was a crazy idea, but I realize now what Anthony Mann (Tony to us) was giving us life and business lessons. Tony passed away this week, and this blog is dedicated to him. It is during this 2-D design class at NSCAD University, over 20 years ago, that I finally got it – I finally understood how to combine image with type. And because of that I have never been able to throw away the project that got me there. Tony set up a long wooden table in his classroom; long enough to fit 16 mounted projects. Once our projects were complete; he asked us to line them up on the table. 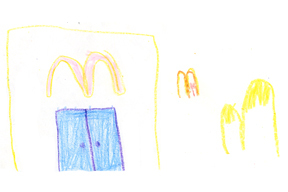 He stepped back, and then asked us to line the work, from best (right side) to weakest (left side). My work at the time was okay. I was shy, and to be honest, it always seemed to stay in the middle of the wooden table – until the bicycle project. One day, Tony asked us take a sheet of blank paper, close our eyes, and draw a bicycle. 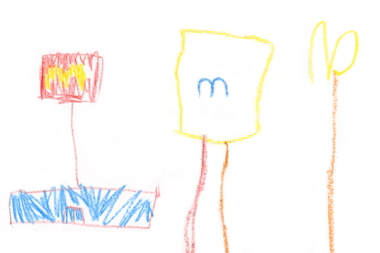 We opened our eyes to see what we had drawn; we saw interesting lines, naïve, almost child-like bicycle drawings; but they were pretty cool. Then he asked us to turn them into an album cover. 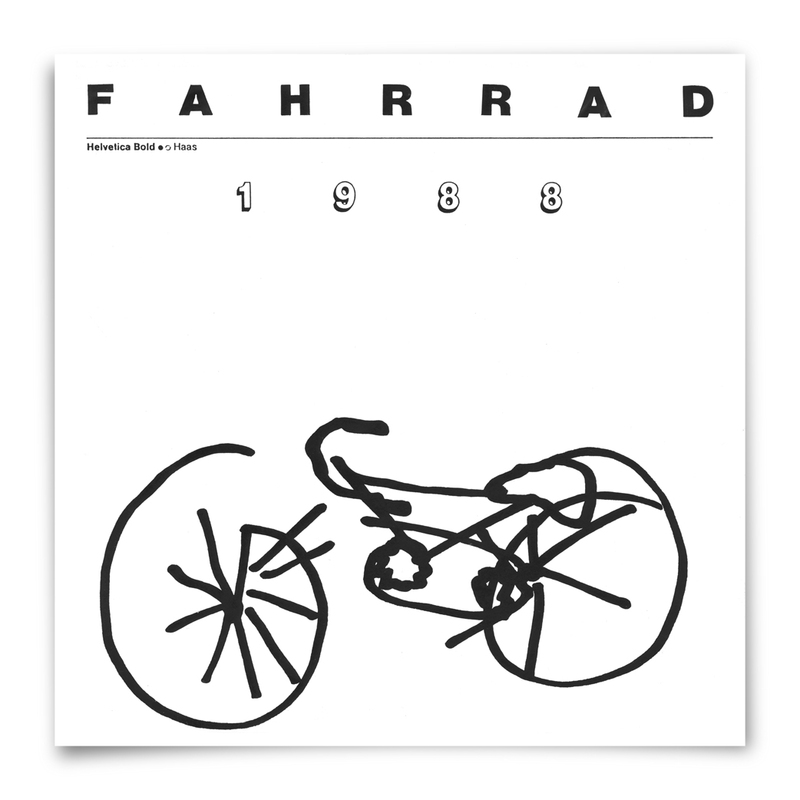 I chose to name mine Fahrrad (German for bike). Though one of my words used a font with an outline and drop shadow (something I may not choose today), it finally looked balanced. Up until then, I struggled with typography, but I remember the moment a friend of mine said; "Hey Joce, that's really good!" And I agreed. It was just black and white, but it was good because it was very simple and balanced. And so my Fahrrad bike made it's way to the front of the table. I dared to move it, but most importantly the whole class also agreed it deserved the number one position on the table. In Tony’s class we learned to check our egos at the door; we learned that constructive criticism is not a personal attack. If your peers felt that your work was just ok; it stayed in the middle; if it was fantastic, it made it way to the top. We had to toughen up to make it outside in the real world. We also learned to work together and agree as a team. Sure, one or two disagreed with the order, but most of the time, everyone was on board with number 1 and number 16. Your position on the table measured the quality of your work and if you wanted to move up to the top positions, you learned to see the work of others as something to rise to. Finally, we learned that we had to have a voice. We learned to fight for what we thought was fabulous or worthy (your own work or someone else's) and to constructively disagree (okay… argue) about something that didn't deserve to be at the top. But the group decision always prevailed. Thanks Tony Mann, and all of my design profs at NSCAD – you made a real impact on my design career. 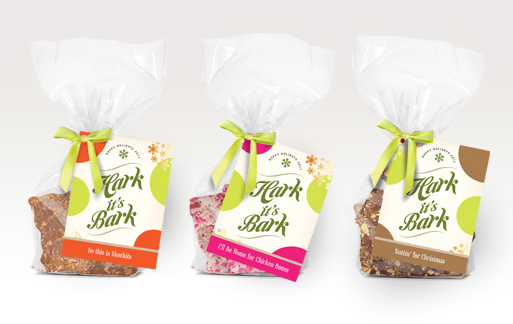 Hark is Bark was a promotion I designed last year with Kathy Mercure of WriteNow! Communications. 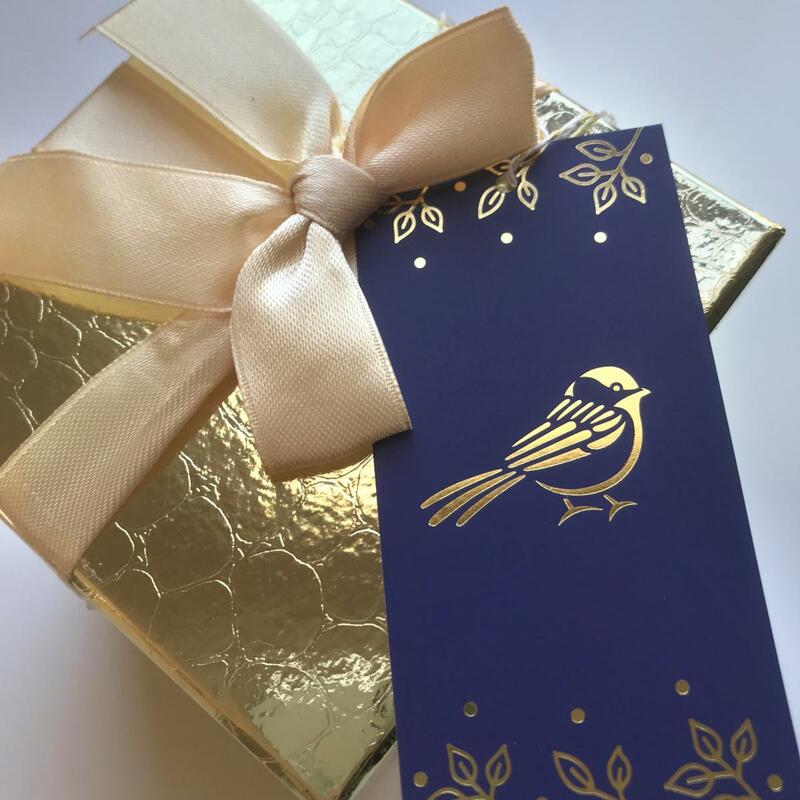 Instead giving the traditional chocolate we decided to make our own bark, created unique, colourful tags and delivered the packages to clients. We created unique flavours too, like "I'll be Home for Chicken Bones" and "So this is Scorbits". 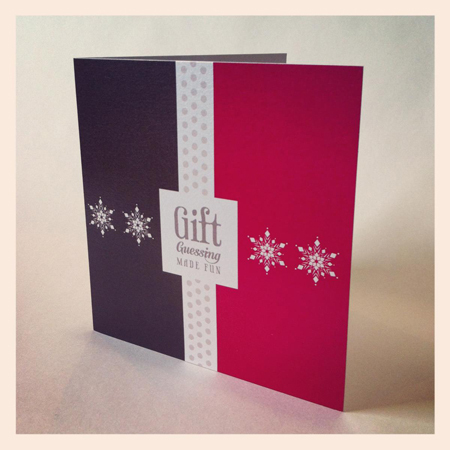 To see the full Hark it's Bark promotion, visit my website and check soon to see what clients recieved for 2012.